Santa Monica, CA, April 8, 2016 – Skydance Television today announced that it will develop Faster Than Light, the best-selling augmented reality comic series that tells the story of humanity’s first thrilling and terrifying adventures to the stars, set in the present day. The story is by Brian Haberlin and artwork is by Haberlin and Geirrod Vandyke. In the very near future, we discover the secret of faster-than-light travel. Suddenly the universe is wide open to us, but are we ready for it? 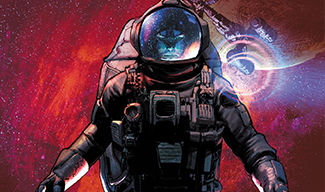 Each issue of Faster Than Light features Anomaly’s cutting-edge augmented reality app, which allows readers to turn the pages of their comic book into realistic 3D animations. It is published by Image Comics, Shadowline and received two Unity Vision Award nominations for best Augmented Reality. Volumes #6 and #7 will be released on May 11, 2016 and June 8, 2016, respectively. Brian Haberlin is a comic book artist, writer, editor and producer. Haberlin began his career at Lorimar/Warner Brothers TV, after which he pursued comic books with Image comics’ Top Cow Productions as Vice President of Creative Affairs. There he co-created the Witchblade franchise, which has had both a live action and animated series. He then founded Avalon Studios and served as Editor-in-Chief for Todd McFarlane Productions. Currently, he is partner in Anomaly Productions, producer of graphic novels, comic books and interactive apps. Haberlin attended Loyola Marymount University.